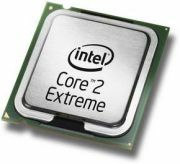 Intel's Core 2 processors, released in July of 2006, are based on the "Core microarchitecture", which Intel calls "Core 2", as apposed to the Pentium's "NetBurst" core, which might be dubbed "Core 1" and was not performance competitive with AMD's Athlon 64 architecture. 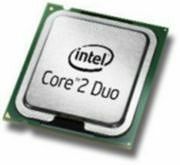 The Core 2 architecture is a dual core design, having two cores integrated on a single die. The dual cores use a 65nm manufacturing process to put 291 million transistors on a 143 square mm die. Each core has its own separate 64KB L1 cache that's divided into a 32KB instruction cache and 32KB data cache. The two cores share an L2 cache that can be either 2MB or 4MB. The Core 2 Extreme, designed for the extreme power required by users such as high-end graphics professionals, runs at a clock speed of 2.93 GHz for the X6800 chip. Core 2 achieves its performance by executing more instructions per clock cycle through a shorter instruction pipeline. Core 2 is also more power efficient, disipating only 65 Watts compared to 130 Watts or more for a high-end Pentium. - Pipelining is a technique where several instructions, each at a different stage of processing, are in the pipeline being processsed simultaneously, when an instruction reaches the end of the pipeline, its execution is complete. Core 2 processors have two cores with Intel's Extended Memory 64 Technology (EM64T) and operate with a 1066MHz Front Side Bus (FSB). They feature the Execute Disable Bit (XDB), which prevents viruses from exploiting buffer overrun vulnerabilities. They operate with 0.85 - 1.3625 Volts and use the LGA775 socket.